April 2007 – Beverley's journey..
but since coming back from Ireland things haven’t been all that ok. So first of all I would like to take a few lines of my blog to pay a tribute to a very special dear friend who died on Thursday evening. My friend Jean was a wonderful lady of 85years and I have been very privileged to have known her for the last 9 years when she joined my reading group. Jean was a wonderful inspiration to us all in the group. She embraced this modern world whilst still retaining the respect and dignity of the time in which she grew up…Jean’s funeral is this coming Friday afternoon which ironically is the day that we had decided on a few weeks ago for our next reading group meeting….somehow I think Jean must have known!! 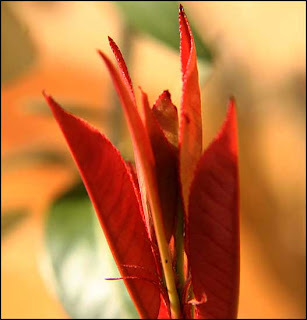 Thank you all my friends for visiting here and your lovely comments which I have enjoyed reading and appreciated very much. My apologies to every-one that takes the time to visit my blog only to discover that nothing has changed since the 11th of the month. I’m going through quite a busy time at the moment and finding it hard to come up with enough spare time here on the PC to sort out my photo’s and post more for you to see. I’m most certainly not going to complain about this wonderful weather we’re having but of course it does mean that I’m outdoors such a lot of the time..my garden is shooting up at such a speed…pray that we don’t have a cold spell now as I think it would cause lots of problems for the delicate plants and our Acer tree is now in leaf!! 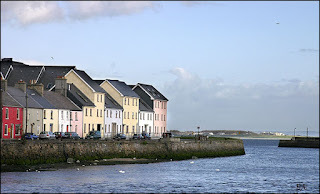 I’m quite excited because today I’ve just found out that I can go with my husband on a business trip to Galway in Ireland…it’s only for two days but as I’ve not been to Ireland before I’m really looking forward to the visit and of course my camera will be with me…please let there be sunshine!! 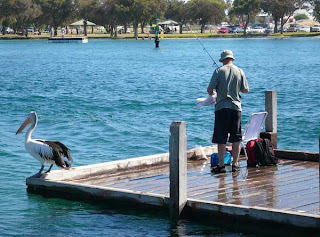 The photo today was taken at Mandurah. In an earlier posting I mentioned watching the Pelicans and they are obviously quite used to being close to humans and also to being well looked after as this one was. It only about 4ft. away from the fisherman and was in no hurry to move away even when I walked up quite near to take the photograph. 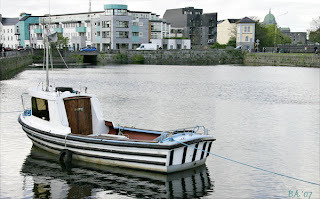 I think the fisherman kept passing him the small fish that he didn’t want to keep! 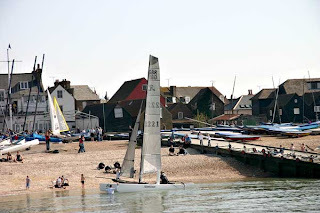 Anyway Easter has been and gone and I must say it was a most enjoyable.We did quite a lot of jobs that needed doing around the home on the Friday went out for dinner that night, went shopping on Saturday and on the Sunday we decided to go to Whitstable in Kent. 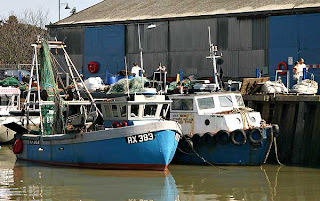 Although it is only some 60 miles from where we live it is a place we hadn’t been to before. It was charming and of course with the sun shinning it looked very pretty. Whitstable is very famous for it ‘cockles’ and sea food. 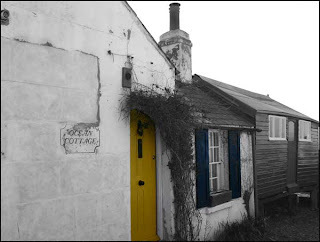 So here are 3 photo’s taken at Whitstable, one of the fishing boats, one of a fisherman’s cottage and one of people enjoying a sunny day out either sitting on the pebble beach or sailing. Today I’m posting a couple of photo’s taken at The Swan Bells in Perth. The first one is of the actual building which houses the bells and the second one is a photo of my husband David having a short lesson from one of the bell ringers. 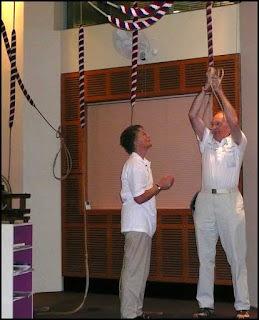 Many years ago David started to learn Bell Ringing at a church not far from where we now live. It wasn’t an interest that he kept up but has, since visiting these bells, said he wouldn’t mind giving it another go but maybe when he has more time after he retires..
I’m posting a history of the Swan Bells that I’ve taken from the web should you be interested in knowing there past! “The Swan Bells is one of the world’s largest musical instruments. The Swan Bells include the twelve bells of St Martin-in-the-Fields which are recorded as being in existence from before the 14th century and recast in the 16th century by Queen Elizabeth I. The bells were again recast between 1725 and 1770 by three generations of the Rudhall family of bell founders from Gloucester in England. From one of London’s most famous churches in Trafalgar Square, the St Martin-in-the-Fields bells have rung out to celebrate many historic events. England’s victory over the Spanish Armada in 1588, the homecoming of Captain James Cook after his voyage of discovery in 1771 and the World War II victory at El Alamein in 1942 are just a few of the momentous occasions marked by the bells. The bells have also rung in the New Year at Trafalgar Square for more than 275 years, and have celebrated the coronation of every British monarch since King George II in 1727. Children the world over have often sung of the bells in the popular nursery rhyme, Oranges and Lemons – “You owe me five farthings say the bells of St Martins”. 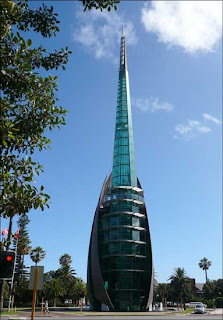 Commemorating Australia’s bicentenary in 1988, the twelve bells of St Martin-in-the-Fields as well as five specially cast bells were presented to the University of Western Australia, the City of Perth and to the people of Western Australia. The London diocese of the Church of England and the parish of St Martin-in-the-Fields gave authority for the project to proceed. The additional bells cast in 1988 include one from the City of London with help given by the City of Westminster, and a total of three bells bestowed by a consortium of British and Australian mining companies. As it’s the start of Easter I thought I would also show you a couple of photo’s that I took recently showing that Spring is really with us now. 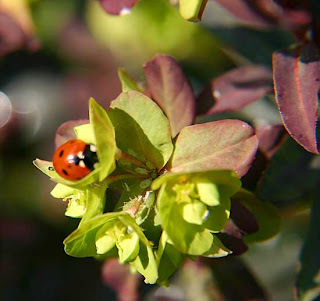 This one to the left is of a ladybird and if you look closely you will see climbing up the stem some greenfly and I’m hoping that they were todays lunch for the ladybird!! So I’ve got over the ‘green paint’ episode and thought I should get back to sharing with you some more photo’s from our holiday. 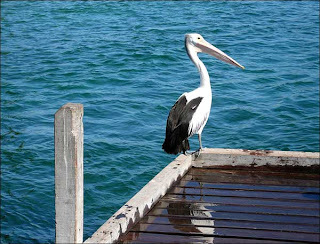 On one of the beautiful hot sunny days and there were so many, we decided to go down the coast to Mandurah. 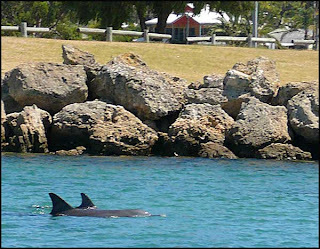 Mandurah is described as a ‘city of endless possibilities and is perched right on the coast overlooking the Indian Ocean. A very friendly, welcoming town but so ‘laid back’ nobody rushes to do anything or go anywhere so as you can imagine very relaxing. We decided to take a boat trip out around the waterways to the harbour, through the Estuary and canals and of course as we were slowly gliding through the waters a pair of Dolphins joined us to swim along side…we watched them for ages and although the boat didn’t get too close to them I was able to get a few photo’s and here’s one I thought you might like to see. When we got back on land and decided to sit for awhile having a cooling drink who comes along but this fellow..A Pelican who seemed to sit around for ever I think in the hope that he was going to get fed but I’m afraid all he got from us was me taking his photo. Thanks every-one for your kind comments on my ‘Green Paint’ episode! !